Find out about one of the best options on the market right now by reading our NETGEAR NightHawk AC1900 review, defiantly one of the best wireless routers. Do you want a flawless home network? Just know, your problems will not end any soon unless you buy an excellent device. It is never easy to deal with constant buffering and lags caused by a poorly performing router. If you rely heavily on your home network whether, in gaming or streaming, the last thing you would want is a network full of frustrations. Our NetGear Nighthawk AC1900 review is a detailed article about all of this routers strong perks. There is nothing as boring as having a troublesome home network in this digital world. The solution to such networks revolves around the entire setup of the router you are using. Therefore, whether you are upgrading your network or are setting up a new one, you must understand the factors to look out for in your next router. If you have many devices like laptops, smart TVs, tablets, streaming media devices, smartphones etc. and want to distribute internet connection effectively, a smart router will work magic for you. A wireless router will work best if you want to move around the house with these devices and at the same time eliminate the clutter brought about by the cables. The level of security you require. The quality of service (QoS) of the router. Nighthawk AC1900 is a next generation Gigabit wireless router that delivers extreme speed. This smart WI-FI router is renowned for its stellar performance and the set of excellent features. With its 1 GHz dual-core processor this is a top-notch device that offers frustration-free network. Compared to its competition, this one of the fastest 802.11ac router on the market. Worse, though, this is one of the bulkiest wireless routers I have seen. The device is relatively expensive and you should go for it if you have good amounts to spend. This NETGEAR router stands as the best they have ever made because of its top-of-the-line features. It is made to suit the needs of every home users by providing a fast and reliable network. NetGear AC1900 review will present all its features. It is a smart WIFI router with a capability to handle high-online bandwidth activities. The router will allow you the freedom to stream, game and boost your mobile WIFI thanks to its simultaneous dual-band and data speed of up to 1900Mbps. When gaming the nighthawk prioritizes your bandwidth to ensure no other device on the network will slow down the connection. This router comes with an advanced quality of service (QoS) feature that lets you manage both downstream and upstream. The feature optimizes your WIFI and prioritizes high-online bandwidth activities like gaming, HD streaming, or video chat to maintain strong and reliable connections. This is one of the best features you would never want to miss for any home network. This a downloadable app for Android and iOS devices that helps you connect, control and monitor your WIFI router from anywhere. With this app, you can repair issues, share files and do a lot more while on the go. This is a free PC software that enables you to schedule automatic back-ups thereby safeguarding your files and photos. The router market has numerous options with every brand looking to capitalize on the weakness of its competitor. This Nighthawk rates well amongst its competitor and provides the best value for every penny spent, the following are some of its best alternatives on the market. This is the best seller in this category, this can be attributed to its fair pricing and its stellar performance. The router supports 802.11ac and has 1750Mbps of total bandwidth if you are looking for a cheaper option to the Nighthawk AC1900 then this might be the best pick. This another option from the same manufacturer, the NETGEAR AC1750 is a smart WIFI router that supports data speed of up to 1750Mbps and comes with high-power antennas. This is almost similar to the nighthawk except for the data speed and price. This router is the best alternative to the Nighthawk, it has four high-performance antennas designed to ensure superior dual-band communication. It supports data speed of up to 1900Mbps and is made with a number of excellent features to enhance its reliability. Has a good looking design. The Nighthawk gives you clear coverage of your home no matter its size and shape. Its amplifiers are high-powered and come with three detachable external antennas that expand the network range effectively. The router also sends separate signals to each device on the connection making its WIFI connections more reliable. Its WIFI is blazing-fast with a data speed of up to 600 plus 1300Mbps and with a 1Ghz dual-core processor you are guaranteed of stellar wired, wireless, and WAN-TO-LAN performance. It has a secure and simple cloud (NETGEAR READY CLOUD) storage that enables you to share or access files stored on your USB drive. Plug the USB drive into your router and simply create your own secure cloud storage. With this router, you will also be able to enjoy the accessibility and convenience of Dropbox and Google drive without any storage limitation, fees or privacy concerns. You do not have to worry when your connection sharing device is slow, Nighthawk AC1900 is made to prevent lag. The router is also made with a smart connect feature that intelligently picks the fastest and most reliable WIFI band for every device. Inside the box, you will find a NetGear AC1900 router and underneath the quick start guide booklet than you will see a power adapter, an Ethernet cable, and four attachable antennas, each item in its own separate place. Quite simple and standard but it's all you need to start and use the router. 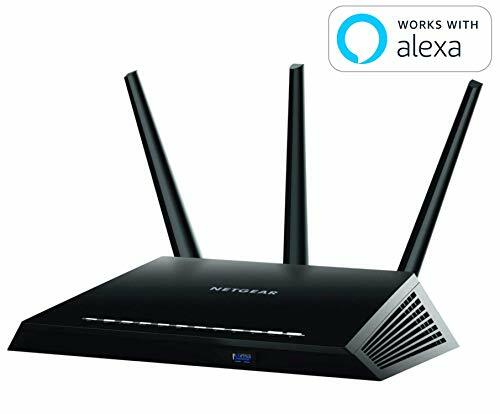 The NetGear Nighthawk AC1900 has two bands (2.4GHz/5GHz), three external detachable antennas which permit it to run at high transfer rate speeds. As far as hardware goes it's equipped with of 256 MB of RAM and a processor of 1 GHz. Some of the features we liked are that it has VPN support and its own firewall. It runs with all major OSs. The bottom line is, NETGEAR Nighthawk AC1900 is relatively expensive but offer the best value for its price. The price and its bulkiness might be its only drawbacks but they are well covered by the excellent features and its incredibly fast connections. If you are looking for a top-notch router for your home network it will be difficult to overlook this device. We hope you liked our NetGear NightHawk AC1900 Review and if you have any suggestions be sure to send us a message, we are always on the lookout for new ideas.